A natural formula produced from olive leaves, Olive Leaf Extract is designed to control lipidemia. It is supported by three clinical studies which have confirmed its ability to lower LDL-cholesterol and triglyceride levels, increase HDL-cholesterol and fight lipid peroxidation. What exactly is Olive Leaf Extract? 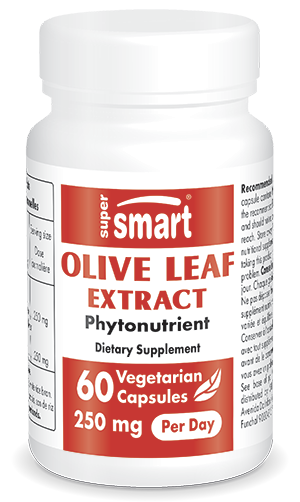 Olive Leaf Extract a natural-source dietary supplement produced from olive leaves. It contains a very high level of oleuropein, a bioactive phytonutrient specific to the olive tree, which helps control blood lipids and prevent carbohydrate absorption. What compounds are in Olive Leaf Extract? The beneficial effects of the olive tree are attributed to its exceptionally high content in phenolic compounds, molecules known for their antioxidant potency. In the olive tree, these compounds play a part in defending the tree from insects, infection, multiple microbial attacks and UV radiation (1-2), but they are also biologically active when ingested by humans. They are known to reduce the risk of a number of diseases by combatting free radicals and improving enzymatic balance. As the oleuropein in olive leaves has been scientifically shown to be responsible for the plant’s benefits, Olive Leaf Extract is formulated to contain an optimum amount of this compound. What are the mechanisms of action of Olive Leaf Extract? 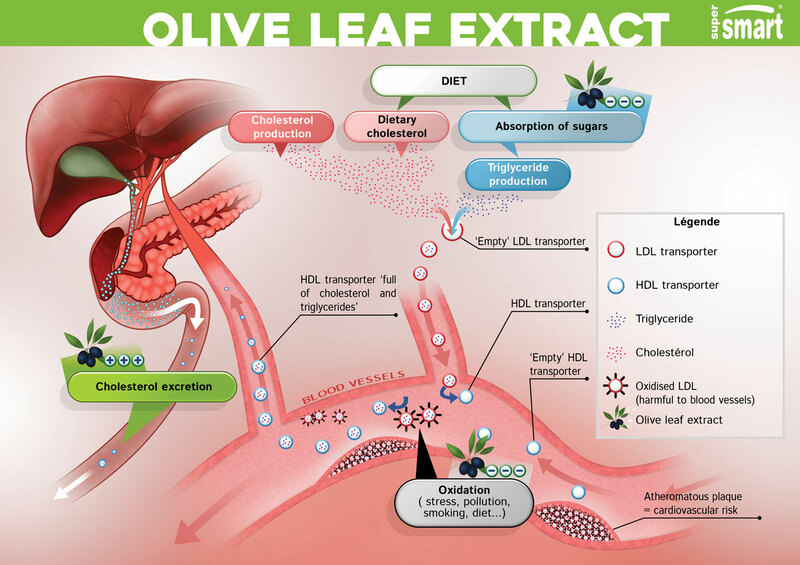 Olive Leaf Extract’s effects on the cardiovascular system. Olive leaves have been used in phytotherapy since antiquity apparently for their antilipidemic, antiseptic and antiviral properties. Scientific research has since confirmed these applications and identified new properties: antimicrobial (4-5), antiviral (6), antifungal (7), gastro-protective (8), blood glucose-lowering (9), blood pressure-lowering (10), antioxidant (11-12), antiatherogenic (13), hypolipidemic (14), anti-inflammatory (15), neuro-protective (16), vasodilatory (17) and anti-ageing (18). The olive tree’s polyphenols, particularly oleuropein, act on cholesterol excretion (19). They promote the elimination of excess cholesterol via the bile ducts, duodenum and finally faeces. The antioxidant potential of oleuropein is exceptional. When elderly institutionalised individuals followed a diet enriched with an extract of oleuropein and its derivatives for six weeks, their antioxidant capacity was shown to improve (20). It is a natural solution to combatting oxidative stress and inhibiting LDL oxidation (21). By binding to sucrase and maltase, two digestive enzymes, oleuropein limits sugar absorption and thus reduces spikes in blood glucose. It also does this by slowing down activity of the sugar transporter, GLUT2. Is it supported by scientific studies? The effect of Olive Leaf Extract has been directly measured in three clinical trials (22). a 10% decrease in total cholesterol and a 5% decrease in triglycerides. In overweight subjects, there was a significant improvement over four weeks in the expected ratio of coronary risk as compared with placebo. A clear decrease in triglycerides was observed. The third study examined the ability of Olive Leaf Extract to reduce oxidative stress. Results showed that daily supplementation with 250mg reduced levels of MDA (malondialdehyde) by almost a third, a urinary marker of oxidative stress. Why use extracts of olive leaf rather than olives? Studies suggest that the leaves and fruit are equally rich in oleuropein (23), but olive leaf is considered a more renewable natural source for extraction (24). Hence its use in Olive Leaf Extract, and its ingredient Olécol®. 1) The antioxidant content of olives depends to a large extent on variety, maturity and preservation. Therefore, if you live a long way away from the Mediterranean region where they’re grown, you can’t really rely on eating olives all year round to boost your cardiovascular health. With its exceptional and stable content in olive tree polyphenols, Olive Leaf Extract provides a solution to this problem, offering populations the world over the opportunity to fully benefit from the advantages of a Mediterranean diet. 2) Eating a Mediterranean diet is associated with a lower risk of all-cause mortality (25). Scientific studies have in large part attributed these protective effects to the role played by the olive tree (26). 3) The bioavailability of oleuropein in humans is very high – between 55% and 60% (27). Maximal plasma concentration occurs two hours after oral administration. Studies have also shown that oleuropein crosses the blood-brain barrier easily. 4) The Mediterranean diet was recognized by UNESCO in 2010 as an Intangible Cultural Heritage of Humanity. 5) Cardiovascular disease is the leading cause of mortality across the world, claiming more than 17 million lives each year. Significantly increase your intake of fruit, vegetables, nuts and wholegrains. Make liberal use of herbs, spices, garlic and onion. Only use olive oil for dressings and rapeseed oil for cooking. Eat at least one yogurt a day (preferably sheep’s milk). Limit your intake of poultry and red meat, and instead choose fish and seafood whenever possible. Be physically active every day (go for a walk after a meal, take part in sports, do some exercises …). These measures are part of the Mediterranean diet which is based on the long-term food habits of Mediterranean populations. They are a good accompaniment to supplementing with Olive Leaf Extract though not essential for obtaining the benefits of this product. Note: this product should not be used as a substitute for a varied, balanced diet and a healthy lifestyle. It’s important to follow the guidelines on how to take it and the recommended dose, and to use it by the ‘best before’ date. It is not recommended for women who are pregnant or breastfeeding, or for children under 15. Keep out of children’s reach. Store in a cool, dry place.